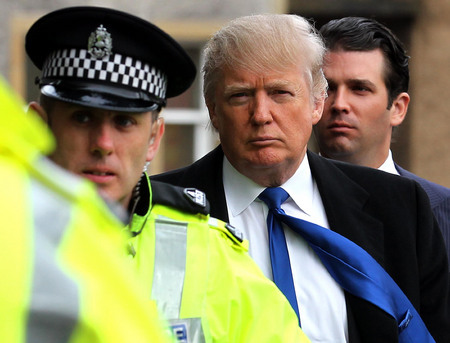 Following the appearance of Donald Trump and Trump organisation Executive Vice-President, George Sorial, at the Economy, Energy and Tourism Committee of the Scottish Parliament on 25 April 2012, I can confirm that he repeated 3 of the 10 lies documented here and added one more. The Official Report of the Committee meeting is available here and the (Col xxxx) references are to column numbers from the report. “Tens of millions” means at least £20 million. From the published accounts of Trump International Golf Club Scotland Ltd. to 31 December 2010, only £6,455,690 has been invested in addition to the £6,917,850 capital to acquire the land. As revealed in the 21 February 2006 “deal killer” email, Scottish Development International (SDI) were telling the Scottish Executive that their “client” was “about to conclude a deal within the next few days” and was seeking “an authoritative view as quickly as possible from the Scottish Executive on the wind farm proposal”. Donald Trump had acquired the bulk of Menie Estate for £4.498 million a month previously on 27 January 2006. SDI can only have obtained these reported views from the Trump Organisation and I have today asked SDI to confirm the source of their information. But as things stand, Donald Trump misled the Committee by saying that by the time he had bought the land, he was confident that the EOWDC project “would not happen” if a month later he was desperately seeking assurances. Under questioning by Patrick Harvie MSP, George Sorial reacted angrily to this allegation. Despite much repetition of this figure, Trump has never produced any evidence to substantiate the claim despite repeated requests to do so. This allegation will be withdrawn if he can prove it is true.